Former Packers WR Sterling Sharpe was inducted into the College Football Hall of Fame this past week. After a decorated career at South Carolina, Sharpe was the Packers’ first-round draft pick in 1988. He played seven seasons with the Packers before a neck injury forced him to retire early. In those seven seasons (1988-94), Sharpe caught 595 passes for 8,134 yards and 65 touchdowns. He ranks second, third and second, respectively, on the franchise’s all-time list in those categories. He also had a streak of 103 consecutive games with at least one reception, second only to Donald Driver’s 133-game streak in franchise annals. Sharpe led the league in pass receptions in three different seasons. 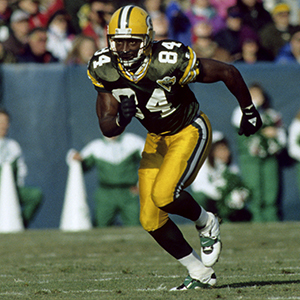 His 112 receptions in 1993 still rank first on Green Bay’s all-time single-season list. His 18 TD catches in 1994 also remain the team’s single-season record. That broke a franchise record that had stood for 52 years, Don Hutson’s 17 TD grabs in 1942. At South Carolina, he hauled in 169 passes for 2,497 yards and 17 touchdowns in his career, catching at least one pass in 34 straight games, with 10 games of at least 100 receiving yards. He’s just the second Gamecocks player to be inducted into the College Football Hall of Fame, joining Heisman Trophy winning RB George Rogers. Sharpe was inducted into the Packers Hall of Fame in 2002.